If you follow our blog(s) you might have read about my first encounter with Philip B’s Anti-Flake Shampoo, way back in 2009 when my eczema first reared its ugly, inflammatory head. Since then, with the help of Philip B, I have done relatively well managing the eczema outbreaks in my scalp. Lately however, I have just felt like my scalp was in need of a deep clean, as if there was build up accumulating that my gently cleansing shampoo wasn’t lifting. And so I decided to give Leonor Greyl’s Bain Traitant à la Propolis a shot. This shampoo is meant to treat dandruff and dry itchy scalp by gently and deeply cleansing. The shampoo contains propolis extracts, which act as a powerful anti-microbial and also garlic and horseradish both of which are proven natural remedies for a variety of skin problems including eczema. And don’t worry! You won’t smell like garlic and horseradish! The fragrance of this shampoo is very gentle and classy; it reminds me of some children’s perfumes we imported from europe many years back. 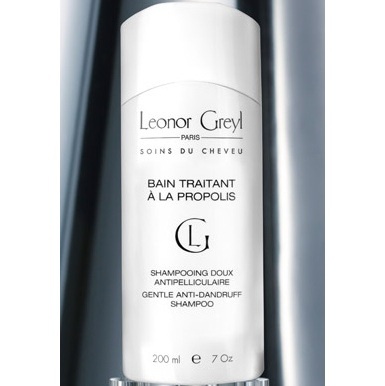 My first impression of this shampoo was that it was a lot soapier than other Leonor Greyl shampoos. I’m so not used to foaming shampoos anymore, I was a little surprised. BUT I realized that the foam was really doing its job and allowing the shampoo to penetrate deep into my hair and scalp with the first shampooing. My scalp is clean and happy, and my hair too! I was expecting to need some kind of product or leave-in but it was just perfect! Looking back a I wonder how I could have ever doubted them!